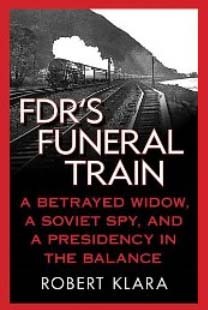 I recently finished reading Robert Klara’s 2010 book entitled FDR’s Funeral Train, the story of FDR’s death and the long train ride with his body that captivated the nation. Klara writes like a novelist, but packed with historical detail so you feel like you were actually on the funeral train with FDR’s body as it traveled from Warm Springs, Georgia where he died, to Washington, DC, and at the funeral ceremony in the White House, and then back on the train for the final leg of the journey to Hyde Park where he was buried. Meet the players: Along the way, the reader meets the key players, from Eleanor Roosevelt bravely baring up even after discovering that FDR’s mistress from years ago, Lucy Mercer Rutherfurd, was present with him when he died. Harry Truman as the new president is totally unprepared and uses the round trip train ride from Washington to Hyde Park as his time to get briefed and pull together his state of the union address he would deliver in just a few days to a joint session of Congress. History as story: FDR’s Funeral Train is history as it’s meant to be written – engaging, accurate, compelling. Klara obviously knows and loves trains and his poetical descriptions make the funeral train come alive. He is also an expert historian, who not only understands that history is a story, but knows how to tell it as a story, with all of its drama and uncertainty. I highly recommend this 204 page paperback for anyone interested in presidential history. For more of a summary of the book, go to Klara’s website.